As the years between 2009 and 2018 continue onward, this Noir acts is a symbol of just how long a well made wine can continue to improve. Obviously proper storage conditions must be maintained to expect a wine to be as good, or better, than it was when initially released in 2011. Sadly there is none of this wine left in our Library. It is Sold Out. 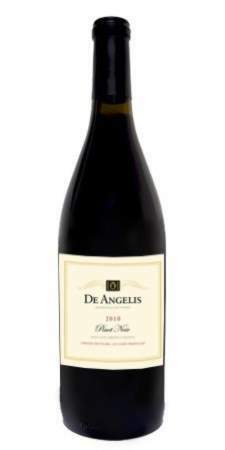 Historically it remains one of De Angelis Wines best sellers – ever! This wine, was made from a 3.1 ton lot of fruit from Cerro Prieto Vineyards on the West Site of Paso Robles California. The fruit was vinified on October 11, 2011 using two different yeasts in two separate fermentations. Half of the fruit was used in each fermentation carried out on each lot. Each yeast contributed different organoleptic properties to each lot. The lots were blended together after fermentation. This additional effort and care resulted in a wine offering soft tannins, medium chain poly-phenols, wonderful aromas and a substantial mouthfeel to this wine. The wine was aged in a combination of Hungarian and French oak barrels for approximately 20 months, and allowed to develop slowly. It was bottled in on June 21, 2013, and subsequently allowed to bottle age for an additional 24 months. As we followed this wine through all its maturation, we well knew that we would have to indeed work hard to equal our fine – completely sold out – 2010 Pinot Noir. 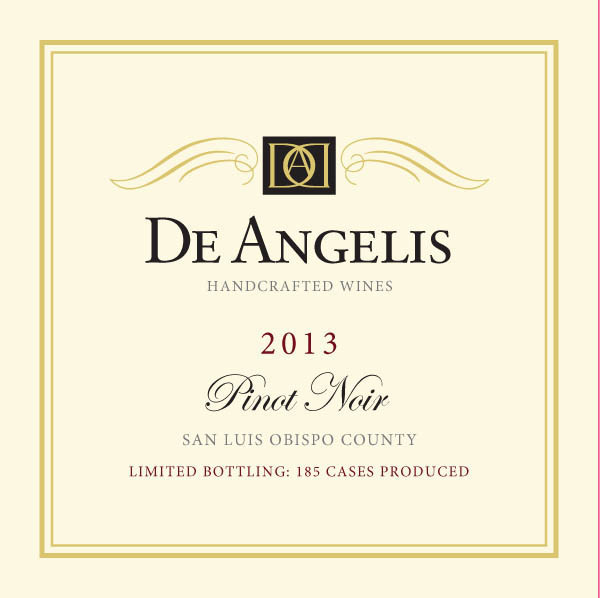 However as we tasted and worked with this wine over its aging lifetime, that concern was assuaged as it became clear that this Pinot Noir would develop into a very fine representation of a De Angelis Wines wine. We have paired it with many different dishes as we allowed it to age. It stands up to aggressively seasoned foods as well as those not so strongly seasoned. On a warm evening, we also enjoy it with a wide variety of cheeses – especially softer cheeses. This wine, was made from a 4.7 ton lot of fruit purchased from two prestigious vineyards on the West Site of Paso Robles California. The fruit was processed on October 18, 2012. Three and a third tons of the fruit was vinified in stainless steel and the remainder in half ton bins. The tank was pumped over twice a day while the bins were gently “punched down” three times a day. We do this to maintain control over the must, as we monitor and maximize color, taste and aroma during fermentation. For those interested in some of the chemistry of this Pinot Noir, the pH was 3.68, the TA is 0.79, and the Brix was 25.5 when picked. Each lot contributed different organoleptic properties to the blended lots once fermentation was complete. This additional effort and care resulted in a wine offering soft tannins, medium chain poly-phenols, wonderful aromas and a substantial mouthfeel to this wine. The wine was aged in a combination of Hungarian and French oak barrels for 19 months, and allowed to develop slowly. It was bottled in 2014, and subsequently allowed to bottle age for 36 additional months. As we followed this wine through all its maturation, we knew that we would have to indeed work hard to equal our fine 2010 and 2011 Pinot Noir vintages. The wine’s color is a deep garnet, but a bit lighter than other red wines, and including some Pinot Noir from other areas of California. 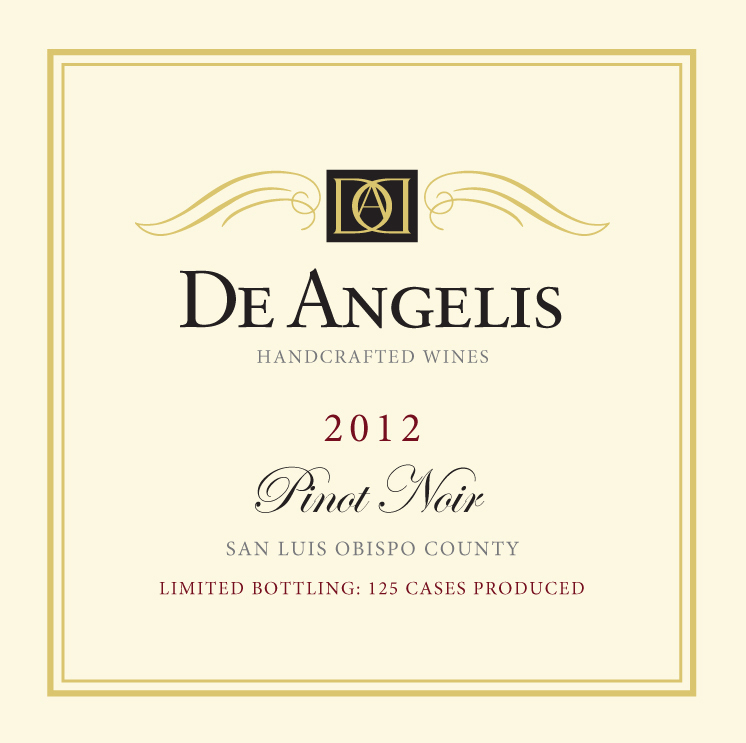 The aroma profile of this De Angelis Wines Pinot Noir offers a nose that is elegant, and a taste that is smooth, with a great acidity and balance. 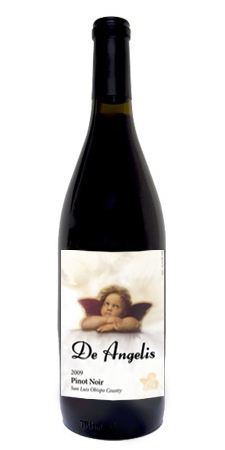 The mouthfeel and finish are what is expected from a balanced carefully made Pinot Noir. Summation: This wine tends to be of light to medium body with an aroma reminiscent of black cherry, strawberry while at the same time offers hints of toasted oak and smooth mild tannins. We have paired it with many different dishes as we allowed it to age. It stands up to aggressively seasoned meat, poultry and fish as well as those not so strongly seasoned. On a warm evening, we also enjoy it with a wide variety of cheeses – especially softer cheeses. Once fermentations were complete, the two lots were blended. Blending enhanced different organoleptic properties and contributed to the overall balance of this Pinot Noir. This additional effort and care resulted in a wine offering soft tannins, wonderful aromas and an initial mouthfeel to this wine that foretold what it would be like when properly aged in barrels. The wine was aged in a combination of Hungarian and French oak barrels for 24 months. It was bottled in on June 23, 2015, and subsequently allowed to bottle age. It will released in 2018. As we followed this wine through all its maturation, we knew that we would have to indeed work hard to equal our earlier Pinot Noir vintages. The wine’s color is a deep garnet. The “nose” of this Pinot Noir is slightly floral and elegant. The wine artfully provides a subtle acidity and balance to the consumer..
Summation: This medium body wine is reminiscent of black cherry, strawberry while at the same time offers hints of toasted oak and smooth tannins. We have paired it with many different dishes as we allowed it to age. It stands up to aggressively seasoned meat, poultry and fish as well as those not so strongly seasoned.